At right, Air Force Master Sgt. 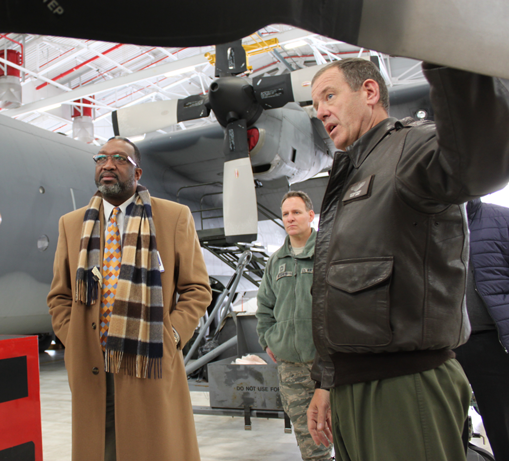 Gerald Kurz, a loadmaster with the 102nd Rescue Squadron assigned to the the 106th Rescue Wing and current student at Suffolk County Community College, describes the details of the HC-130 P/N King to Suffolk County Community College President Dr. Shaun L. McKay, left. Suffolk County Community College will offer courses at Francis S. Gabreski Air National Guard base, home of the 106th Rescue Wing, located in Westhampton Beach this spring. A first for the 106th Rescue Wing and the college. Suffolk County Community College will offer two courses this spring that will enable Air National Guard members to gain credits towards an associate degree from the Community College of the Air Force (CCAF). The CCAF degree is mandatory for higher level promotions. Psychology 101 begins on February 1 and English 101 follows on February 6. Suffolk County Community College President Dr. Shaun L. McKay announced the innovative program with wing leadership last fall at a dedication ceremony for a Veterans Plaza at the college’s Eastern Campus honoring Suffolk County Community College student and Air National Guard Tech. Sgt. Louis Bonacasa, 31, killed in action in December of 2015 while serving in Afghanistan as a security forces defender. “Suffolk County Community College is committed to assisting our military by helping them achieve their educational and personal goals. In the process, we know we are fulfilling our community mission as well as helping to produce a new generation of lifelong learners equipped with the skills they can utilize both during their careers and long after,” said College President Dr. Shaun L. McKay. Dr. McKay added that the program will continue for the foreseeable future. Posted on February 1, 2018, in Uncategorized and tagged Education, Francis S. Gabreski Air National Guard base, Long Island, State University of New York, Suffolk County Community College, Westhampton. Bookmark the permalink. Leave a comment.